With the sun-room windows open, ivory vases overflowing with tulips and gardenias and tall glass flutes filled with sparkling Mimosas, a vibrant brunch is a beautiful way to welcome spring. After Marni put together the most beautiful, thoughtful, wonderful shower a twin sister could ask for (I could easily keep going), I decided it was only fair to take the reigns on Mother’s Day. 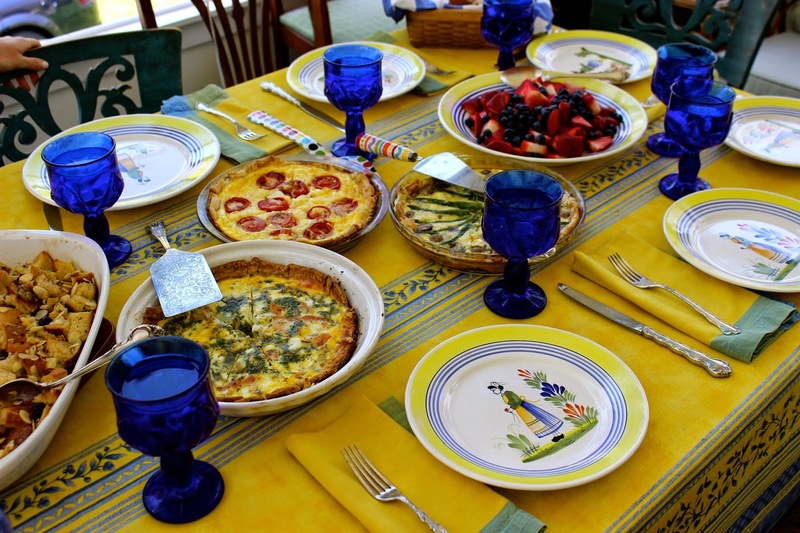 Our family enjoys fun combinations of savory quiches alongside a platter of fresh sliced fruit, and a simple, green salad. Using the same custard base for all, I mixed and matched various cheeses, meats, veggies and herbs (I love experimenting with different flavor combinations). I came up with three tarts so everyone could choose their favorite or sample a sliver of each! Grease each 9-inch pie pan. Roll out dough on a floured surface and place in each pan. Fold and crimp the sides of the crust all around. Pierce the middle all over with a fork and bake until slightly golden, about 12-15 minutes. Meanwhile, prepare the Base Egg Mixture in 3 large bowls (each bowl with 6 eggs, 3/4 c milk, salt and pepper). Whisk the ingredients in each bowl until combined. Sprinkle the cheese from each Choice of Fillings into each prepared pie crust. Pour the Base Egg Mixture on top. Sprinkle the remaining Choice of Filling ingredients on top. Be sure to play close attention especially to the arrangement of the halved tomatoes in one quiche and asparagus in a fan in the other. 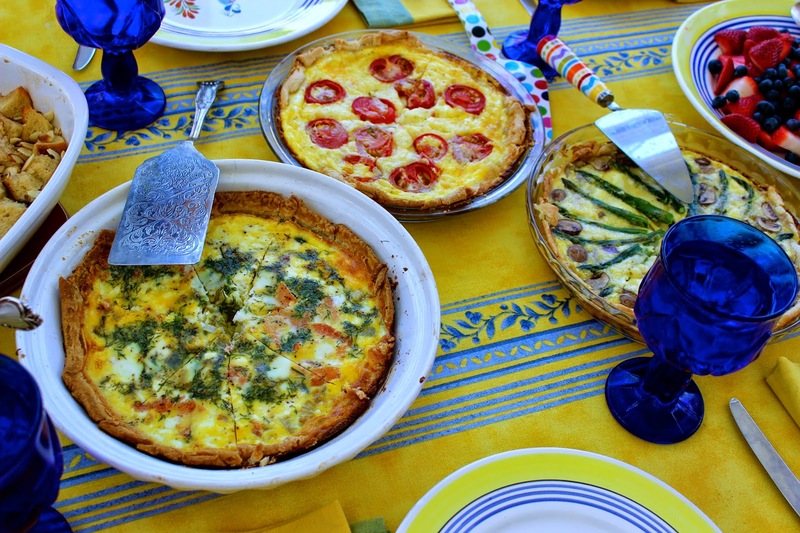 Transfer quiches to the oven and bake until the filling is set, 35-40 minutes. Let cool for at least 15-20 minutes, cut into slices and serve.